Incident in which car hit 3 soldiers in Gush Etzion may likely an accident, ISA source says. Condition of one of the soldiers is worsening. Several hours after the arrest of the driver whose car hit three soldiers in the Etzion Bloc Wednesday, the investigation has reportedly taken a meaningful turn. A security source said Thursday that the interrogation of the driver and other findings from the investigation indicate that the event was apparently not an intentional terror attack but a hit-and-run accident. The source has been described in one report as being from the Israel Security Agency (ISA, or Shin Bet). Meanwhile, the condition of one of the soldiers who was hurt, and who has been listed as being in serious or critical condition, has taken a turn for the worse. His family has asked the public to pray for Moshe Yonatan Ben Yekara. The driver turned himself in to the Coordination and Liaison Administration in Bethlehem Thursday, and was then arrested and taken to interrogation. A second suspect was also arrested. "The Palestinian suspected of running over the three soldiers last night turned himself into the security forces and has been taken for investigation," an army statement said Thursday. It came as IDF forces tightened the noose on their prime suspect, arresting his father and brother in an early-morning raid near Hevron Thursday. The driver responsible has been named as Hamam Mesalmeh, according to Voice of Israel public radio. 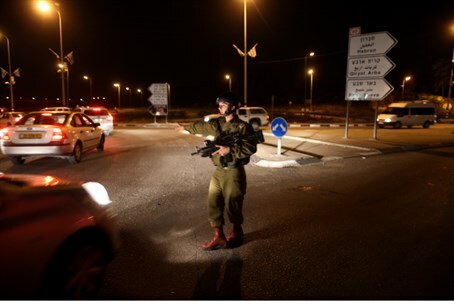 The attack, or accident, occurred at around 10:00 p.m. Wednesday night when the driver of a large van ran over a group of soldiers as they were on duty near a guard stand outside the Arab village of Kafr Al-Arub. The driver then fled from the scene, driving southward. Security forces located the car a short time later, but the driver was nowhere to be found. Three IDF soldiers were injured – one of whom, as noted, is still in critical condition. A second victim is in moderate to serious condition and was operated on Thursday morning. The third was lightly hurt. The Israel police and military have been known to classify terror attacks as accidents out of ulterior motives, i.e. to prevent what they see as dangerous anger on the Jewish side. The 2011 murder of a father and son, Asher and Yehonatan Palmer hy"d, was infamously initially classified as an accident in order to prevent embarrassment during a sensitive time in the "peace process." The murder of Rabbi Moshe Talbi hy"d earlier that year was initially classified as a suicide. Investigators also took a long time to classify the murder of Shelly Dadon hy"d this year as a terror act. The investigation into the murder of rappeller Netanel Arami hy'd was placed under a gag order for no apparent reason until it was revealed as being a terror act. Video of the event shows the car swerving off the road and in the direction of the soldiers before hitting them.